Spring is my favorite time of year! Everything is bursting out in blooms, the air feels and smells different and the sun casts a different light... 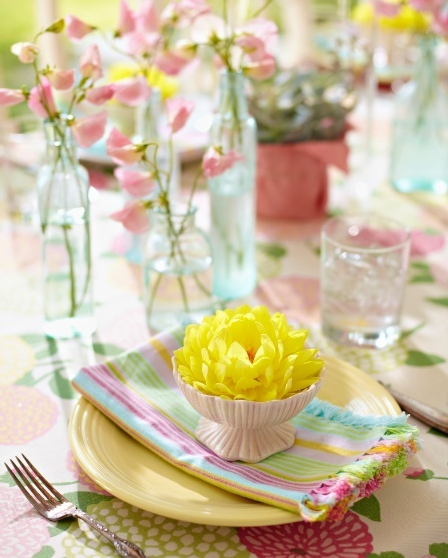 I have an entire "board" on Pinterest that is nothing but beach tablescape ideas - thought I would share a few of the spring ones with all of you. Perfectly simple! 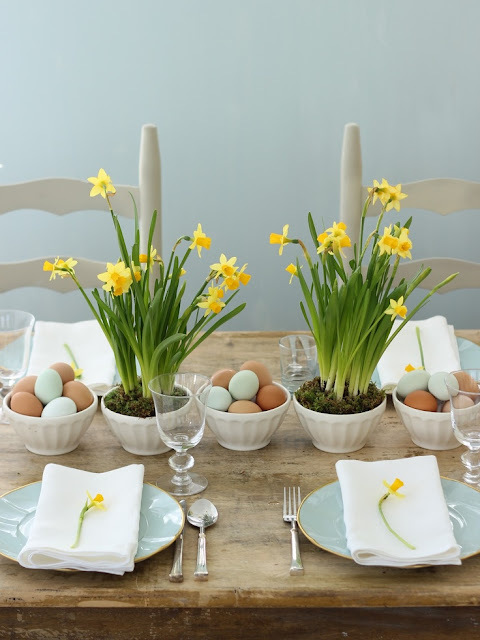 Blooming Daffodils compliment the rustic, beach-feel table settings in aqua and white. 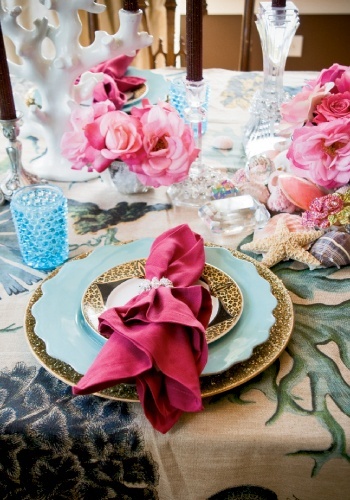 Delicate florals mixed with coral - so pretty! Love those white flowering branches, combined with soft aquas! 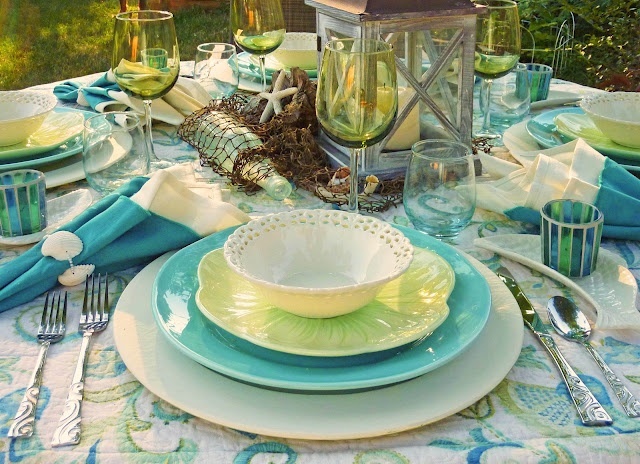 Aqua and lime - perfect beachy spring colors! 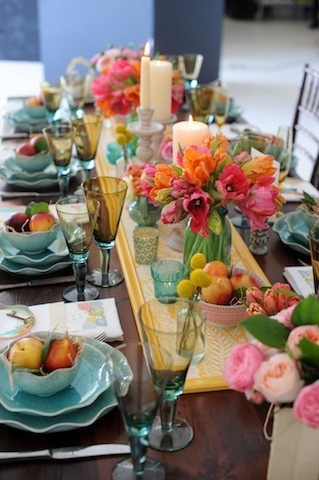 Pinks and oranges with a tiny gift for your guests! 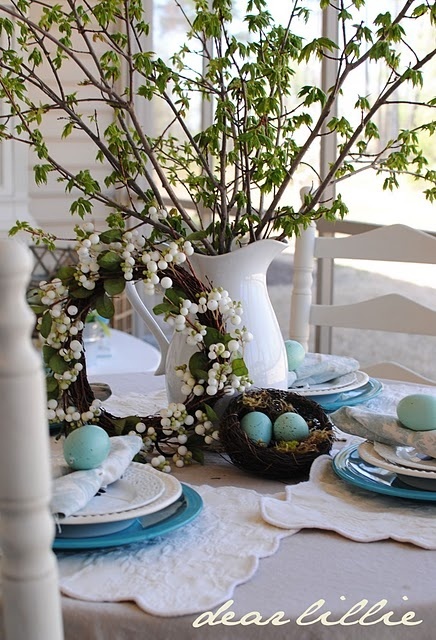 This table idea is my favorite. 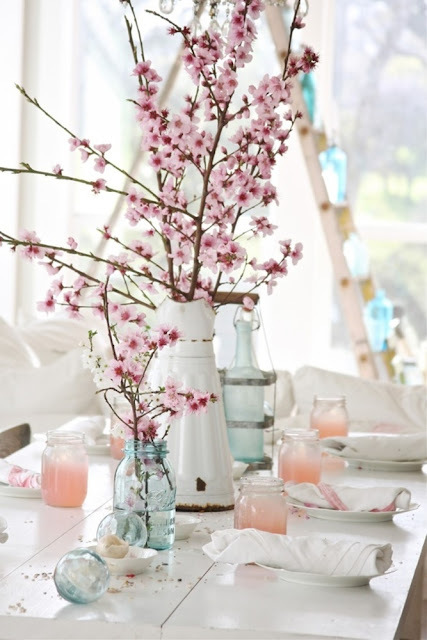 I love how cutting early spring blooming branches brings nature into your home. 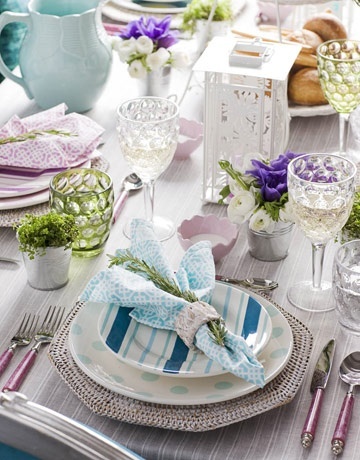 The aqua, white and pink shades flow together perfectly for a home at the beach. 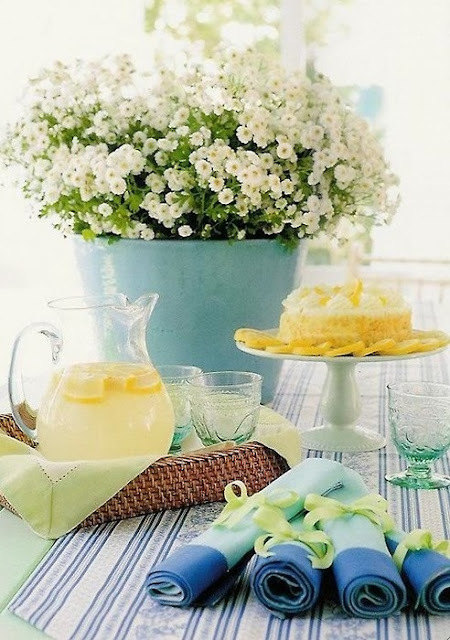 This is a look that is super simple to recreate, mason jars, white dishes, vintage linens, aqua glass balls (or aqua sea glass chunks would work!) and flowering branches. Ah.... this is when I miss my old house and the myriad of plum trees and flowering apples. 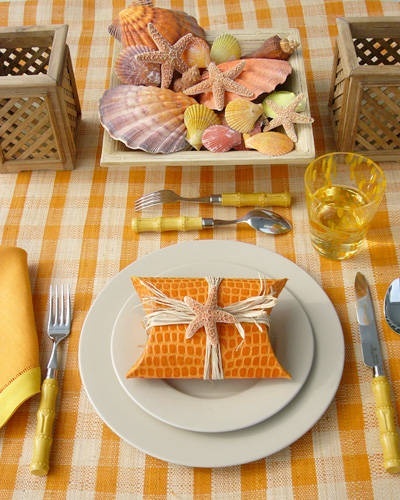 All of these ideas, and their sources can be found on my Pinterest Board - "Beachy Tablescapes". 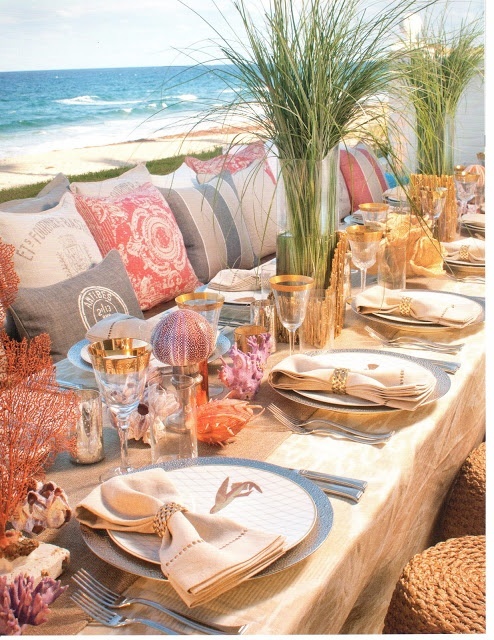 For more inspired beach table ideas - I highly recommend these blogs! Spring Scallop Salad- Super Easy! My Island - Where Art Comes to Life!